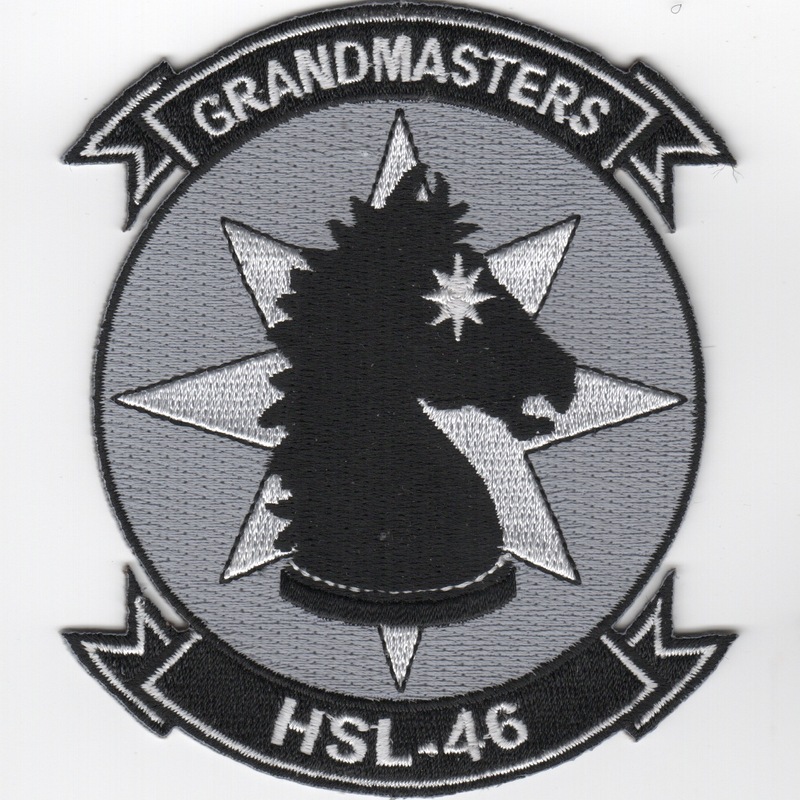 This is the black 'Horse-looking-right' version of the squadron patch for HSL-46 "Grandmasters" that flew the LAMPS Mk3 SH-60 Seahawk out of NS Mayport, FL. 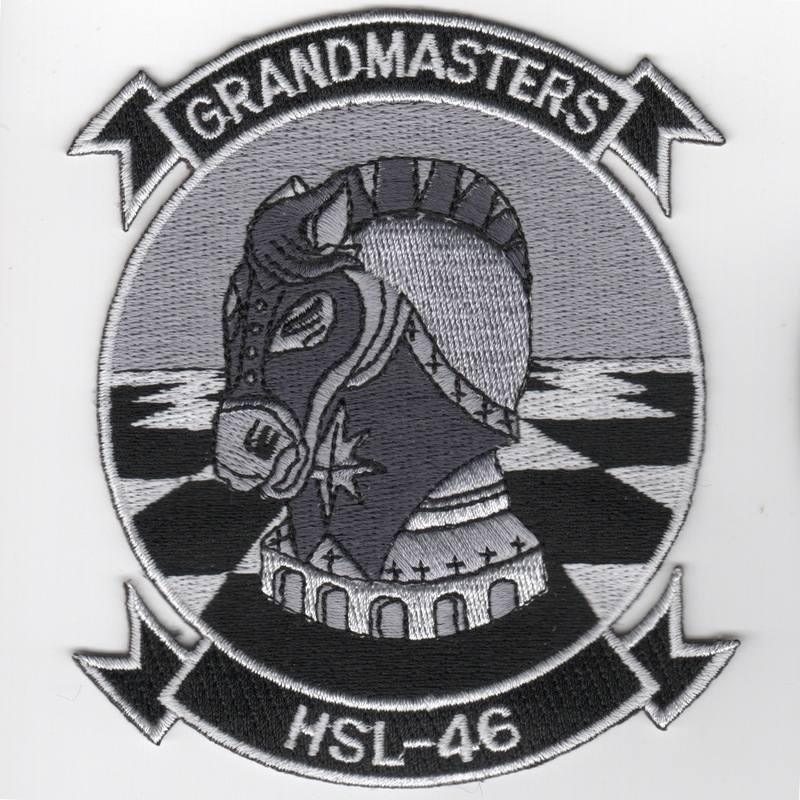 This is the black 'Horse-looking-left' version of the squadron patch for HSL-46 "Grandmasters" that flew the LAMPS Mk3 SH-60 Seahawk out of NS Mayport, FL. This is the 2005 det patch for the HSL-46 "Roughriders" while aboard DD-963. Not sure who Morgan is, but it was his last call. Any info would be appreciated by all. This is the 2004-2005 det patch for the HSL-46 "Roughriders" while aboard the USS Monterey (CG-61). They were deployed over to the gulf with the USS Monterey, and therefore their det name (Roughriders) was derived from their ship's call sign. The car is an Oldsmobile Cutlass derived from their squadron's call sign being Cutlass, and the IV in the background is for Detachment four. We tried to have a woman next to the lowrider, but were shot down by others higher in the food chain, so they had her placed on our nametags so that she would be facing back towards the car in their patch when they were out at sea wearing their flight suits. Hellfire and Damnation were the 2 names that the maintainers dubbed for our 2 helicopters Cutlass 467 and 474. This is the det patch from Operation Iraqi Freedom for the HSL-46 Grandmasters that fly the SH-60B out of NAS Mayport, FL. It states the "Baghdad Parking Permit", World's Largest Parking Lot. This is the det patch from Operation Iraqi Freedom for the HSL-46 Grandmasters that fly the SH-60B out of NAS Mayport, FL. It states the "Terrorist Hunting Permit". This is the HSL-46 Plane Captain patch for the Grandmasters that fly the SH-60B out of NAS Mayport, FL. This is the HSL-46 Black "I" (Eye) patch for the Grandmasters that fly the SH-60B out of NAS Mayport, FL. Have been told that they are the "black eye" of the helo fleet due to parts shortage and lack of funding for more parts. Other than the items out of their hand, they are one helluva squadron!! 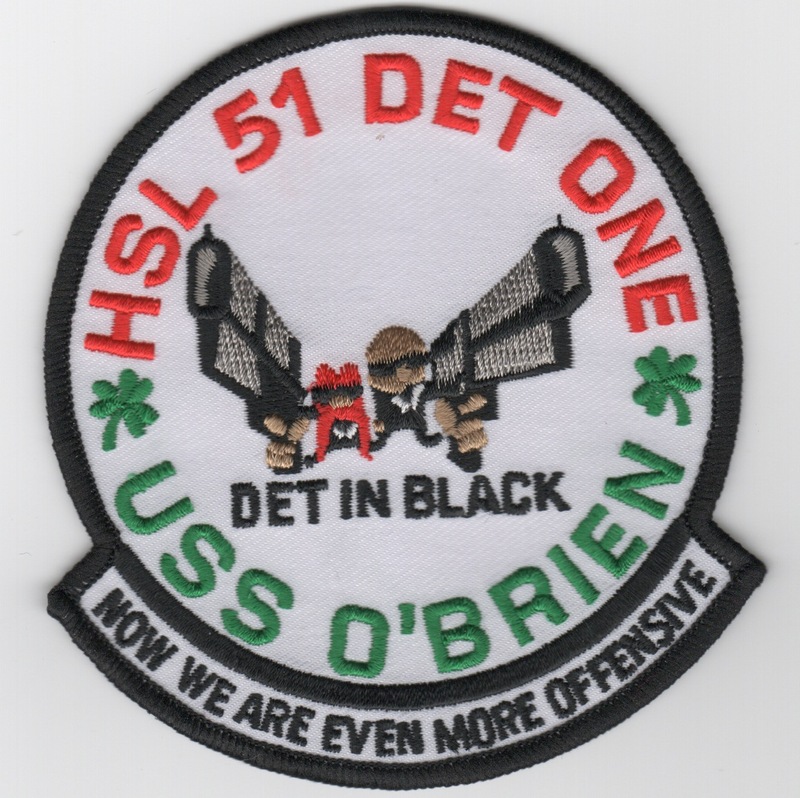 I am pretty sure of the meaning of this patch from HSL-46 is to represent the wives or spouses of HSL-46. Someone from that unit or associated with the unit order them then NEVER paid -- damn that bugs me!! This patch does not come with velcro attached. 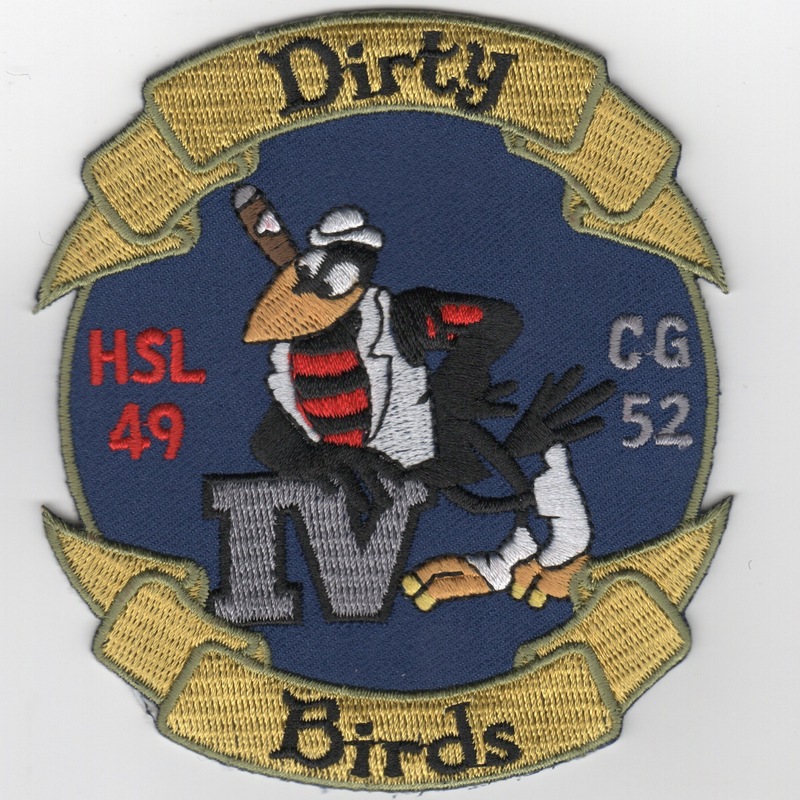 This is a patch created by HSL-46, Det 3 while aboard FFG-39. It states "Taking Care of Business" along the bottom with a "3" in the lightning bolt. This is the color version of the famous "Don't Tread on Me" flag worn on the flight suit sleeve. HSL-47 just received these and said a directive for the Navy came out that these are now an authorized flag that can be worn on DET on their flight suits (unconfirmed). This is the desert version of the famous "Don't Tread on Me" flag worn on the flight suit sleeve. HSL-47 just received these and said a directive for the Navy came out that these are now an authorized flag that can be worn on DET on their flight suits (unconfirmed). 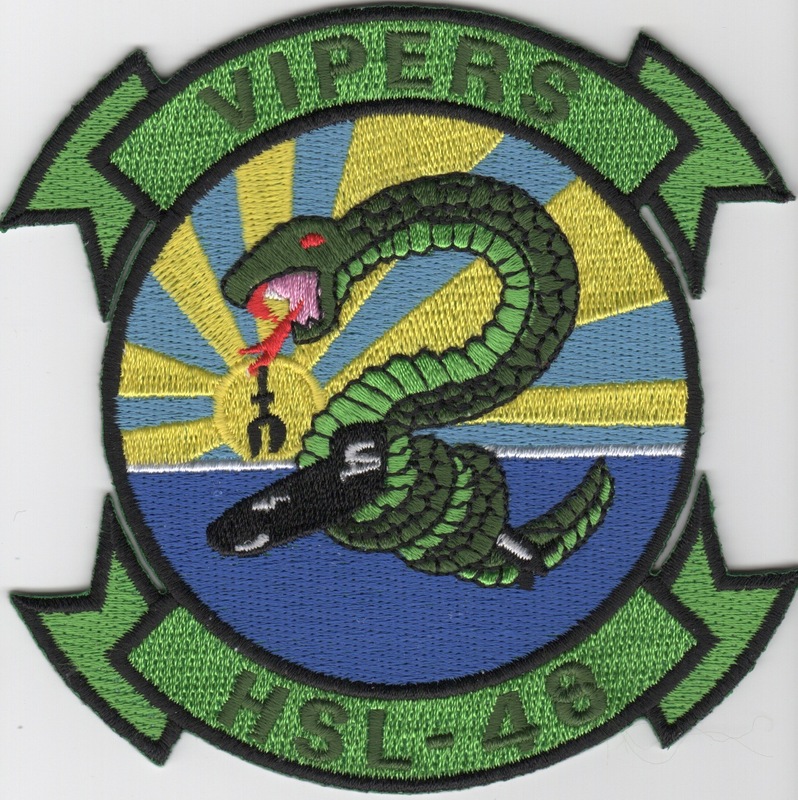 This is the squadron patch for the HSL-48 "Vipers". The "Vipers" are a United States Navy helicopter squadron based at Naval Station Mayport, Mayport, Florida. HSL-48 is attached to Commander, Helicopter Maritime Strike Wing Atlantic and deploys detachments aboard U.S. Atlantic Fleet cruisers, destroyers and frigates. HSL-48's primary mission is to employ combat-ready helicopter detachments in support of battle group commander's objectives. The squadron's primary missions are Surface Warfare (SUW) and Anti-Submarine Warfare (ASW). Secondary missions include Search and Rescue (SAR), Vertical Replenishment (VERTREP), Medical Evacuation (MEDEVAC), Naval Surface Fire Support (NSFS), and Communications Relay (COMREL). The Vipers of HSL-48 fly the SH-60B Seahawk multi-mission helicopter from Navy surface combatants. 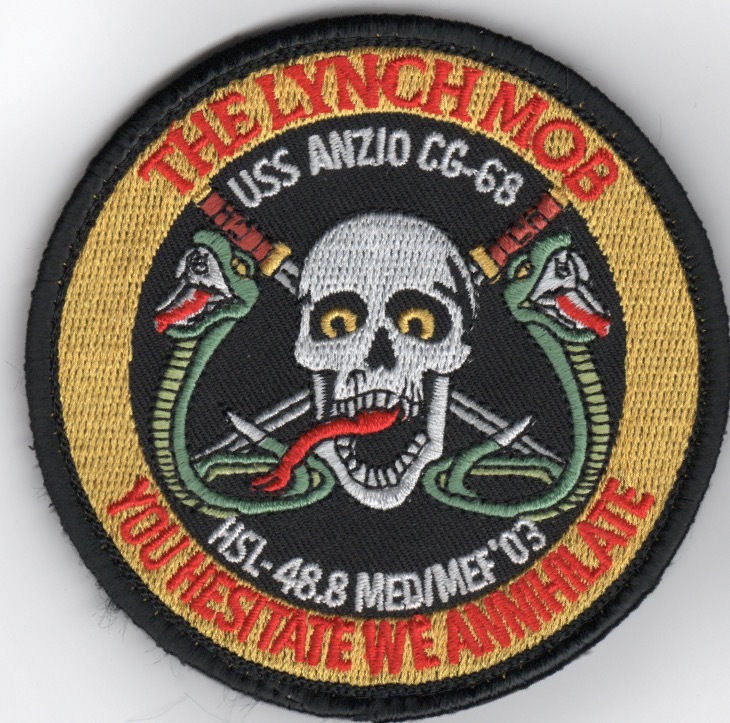 This is the color version of the HSL-48/USS Anzio (CG-68) Med/MeF 2003 Detachment. They fly the SH-60B out of NAS Mayport, FL. It states "You Hesitate, We Annihilate" along the bottom and comes with velcro attached. This is the subdued version of the HSL-48/USS Anzio (CG-68) Med/MeF 2003 Detachment. They fly the SH-60B out of NAS Mayport, FL. It states "You Hesitate, We Annihilate" along the bottom and does NOT have velcro attached. This is the desert version of the HSL-49 Squadron patch for the "Scorpions". They fly the SH-60B out of NAS North Island, CA. This is the WestPac 2003 Det patch for the HSL-49 "Scorpions". They are onboard the USS Rodney M. Davis for this cruise, and it states "Westcoast" vertically and "Choppers" horizontally. They fly the SH-60B out of NAS North Island, CA. Helicopter Anti-Submarine Squadron Light FOUR NINE (HSL-49), was a United States Navy Maritime Strike helicopter squadron based in San Diego, California. The Scorpions of HSL-49 were an operational fleet squadron based at NAS North Island. The squadron provides combat-ready pilots, aircrewmen, technicians, and aircraft to Pacific Fleet warships. The squadron operated the MH-60R Seahawk helicopter. This is one of their Detachment patches for Det-2. 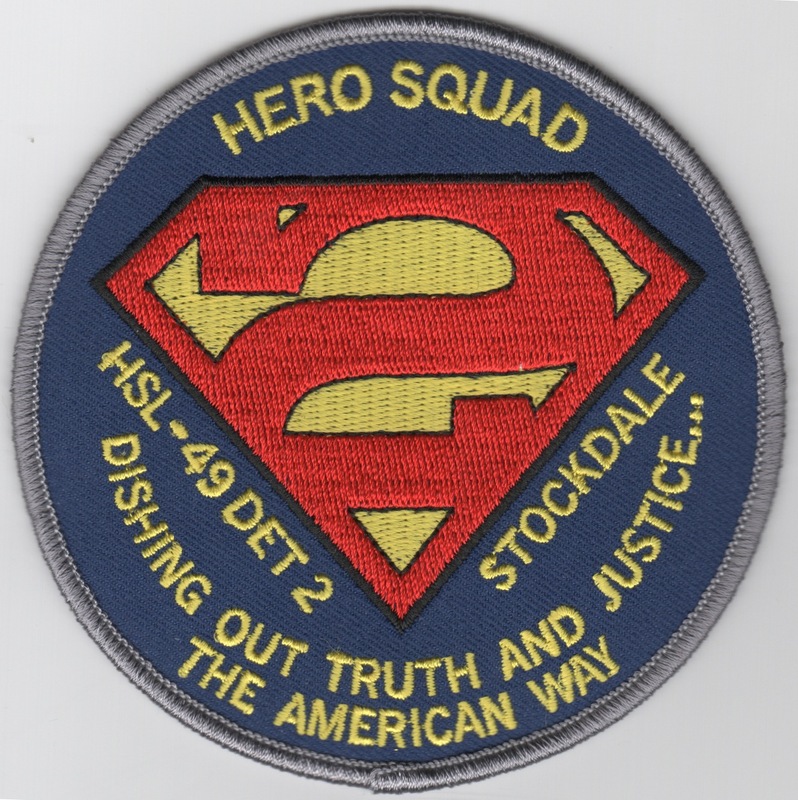 It says "HERO SQUAD" at the top w/Superman's Crest (backwards) in the middle. This patch does not come with velcro attached. Helicopter Anti-Submarine Squadron Light FOUR NINE (HSL-49), was a United States Navy Maritime Strike helicopter squadron based in San Diego, California. The Scorpions of HSL-49 were an operational fleet squadron based at NAS North Island. The squadron provides combat-ready pilots, aircrewmen, technicians, and aircraft to Pacific Fleet warships. The squadron operated the MH-60R Seahawk helicopter. This is one of their Detachment patches for Det-4. It says "Dirty Birds" at the bottom and does not come with velcro attached. 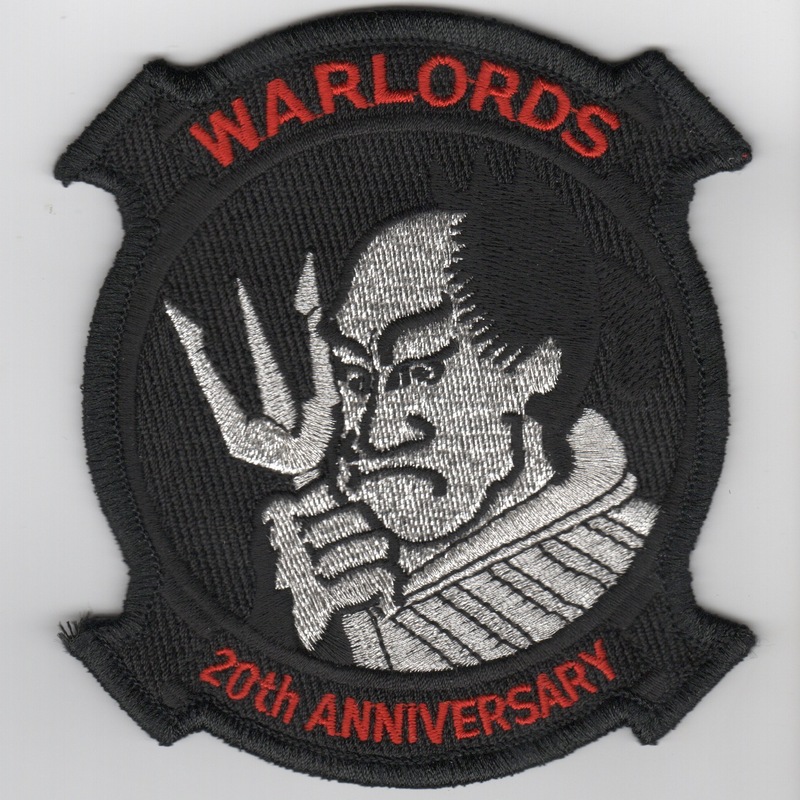 This is the WestPac '02-'03 Det patch for the HSL-49 "Scorpions". They are onboard the USS Valley Forge (CG 50) for this cruise, and it states "WAR PIGS" at the top and "CRY HAVOC" at the bottom. They fly the SH-60B out of NAS North Island, CA. This is the HSL-51 Detachment patch for DET-1. It is a play on the "Men In Black" by saying "DET IN BLACK" and says "Now We Are Eveen More Offensive" along the bottom. Neat patch. 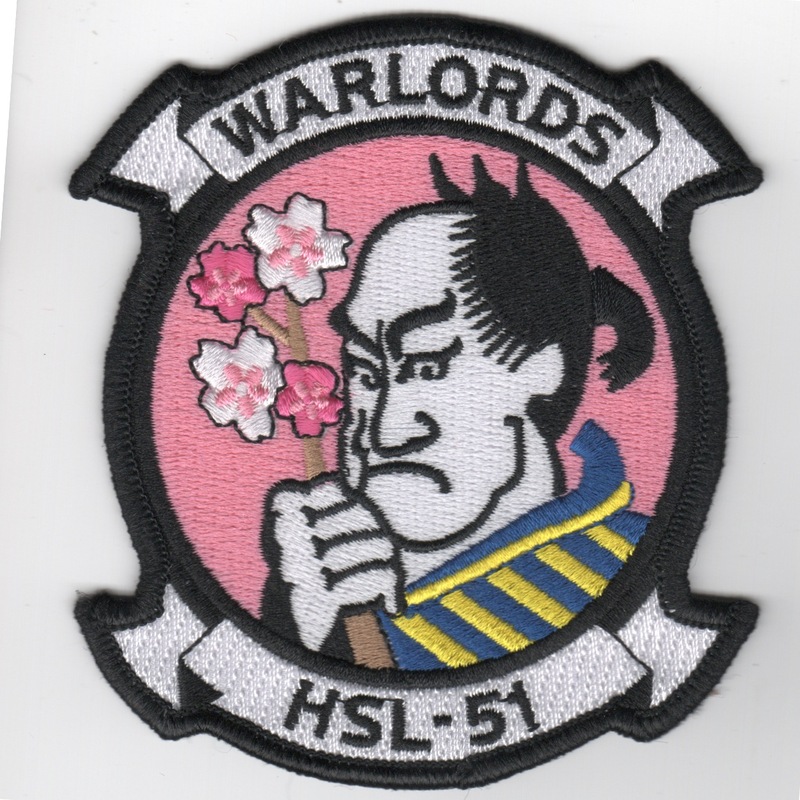 This is the "pink" version of the HSL-51 "Warlords" Squadron patch depicting the Samurai holding flowers instead of a Trident....this patch is not seen very often, as I picked these up from a collector out of Australia. It does not come with velcro attached. Get it while it lasts!! 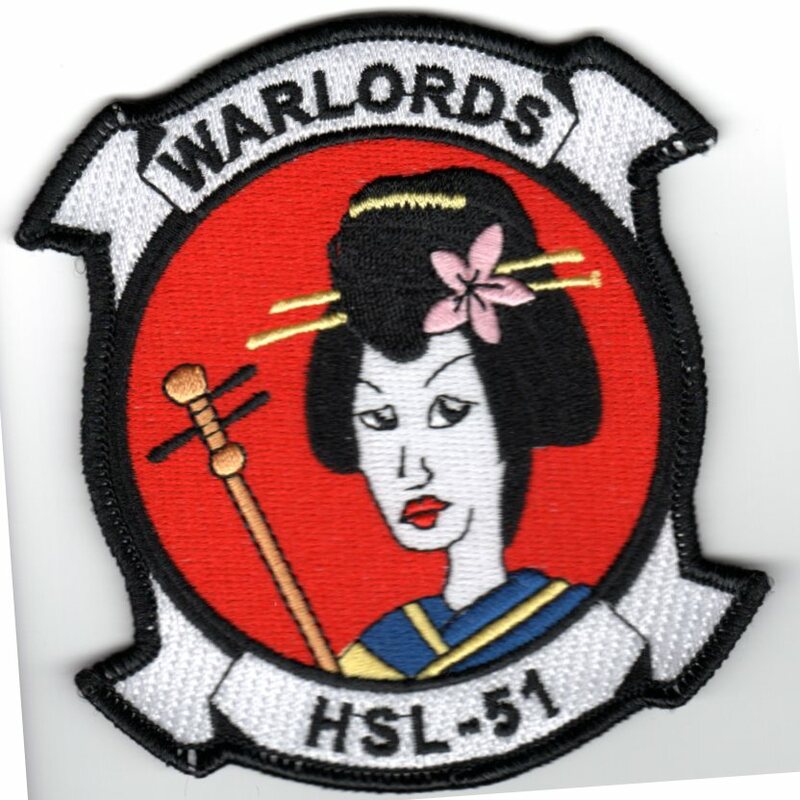 This is the "GEISHA GIRL" version of the HSL-51 "Warlords" Squadron patch depicting a traditional Japanese Geisha Girl holding some type of staff instead of a Trident....this patch is not seen very often, as I picked these up from a collector out of Australia. It does not come with velcro attached. Get it while it lasts!! This is the HSL-84 Decommissioning patch they created back in 2001. It commemorates they legacy from HS-84 flying the SH-3H Sea King to their final as HSL-84 flying the SH-2F.